January 24, 2010 - While going through airport screening at Philadelphia International Airport, on January 5, 2010, Rebecca Solomon, age 22, a student at University of Michigan who was on her way back to school from winter break became a victim of a joke played on her by a Transportation Security Administration worker. "He let me stutter through an explanation for the longest minute of my life," said Solomon. As Solomon was going through screening for a Northwest Airlines flight to Detroit, she passed her personal belongs onto the conveyor to be x-rayed. 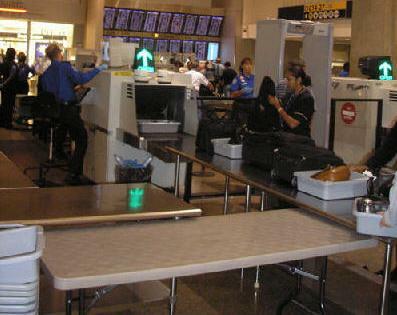 As her belongings began coming out of the x-ray machine, Solomon was confronted by a TSA worker who questioned her regarding a plastic bag containing a white powder he had pulled from her laptop computer bag. The TSA worker requested from Solomon to give an explanation of what the white substance was in the plastic bag. Solomon stunned by this discovery stated “it’s not mine”. Within seconds she franticly tried to process the events in her head in order to come up with a logical answer to give the TSA worker. The TSA worker turned to a coworker, paused, and then turned back to Solomon. In hand, the TSA worker waved the baggie of the white substance in Solomon’s face and stated, with a smile on his face he was kidding and that the bag belonged to him. The TSA worker paused and then stated you should see the look on your face and then told Solomon she was free to go. Passengers who witnessed the events became mortified. Fearing a reprisal, many passengers kept to themselves fearing an act of vengeance by the TSA workers continued through screening without discussion. Solomon angered by the events sought out a supervisor along with a consoling passenger. Solomon and one other passenger filled out a complaint form. "I had been terrified and disrespected by an airport employee he'd joked about the least funny thing in air travel." While filling out the form, Solomon was told that the TSA worker she was filing the complaint against, was at the time training another TSA worker on detecting contraband. TSA initiated an investigation into Solomon’s complaint and upon review determined the employees actions were inappropriate and unprofessional, TSA terminated this employee. Solomon was notified of the employee’s dismissal.